Cosco ET 1000 DS Elliptical Cross Trainer has a programmable computer button resistance with a friction free electromagnetic resistance. It has some amazing features like p Programmable Computer features programs, dual action upper and lower body aerobic work out and large windows LED readout. Generator : 230mm, One Way Pulley : 300mm, Crank : 3 Pcs. *Note: Most of the sites, stores or shopping portals listed above sell Cosco ET 1000 DS Elliptical Cross Trainer with discounts and other exciting offers. 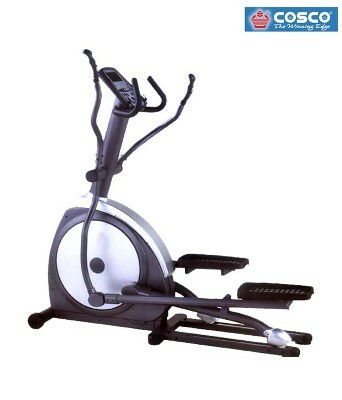 There is a possibility that the some of above websites are not selling Cosco ET 1000 DS Elliptical Cross Trainer now. Toughtrain.com is not liable for such cases or instances. Also we do not recommend any seller for Cosco ET 1000 DS Elliptical Cross Trainer and a buyer should buy from where he/she gets best deal with quality of products, service and on time delivery (shipment).